Please take into account that both the observing procedure and the reduction method have been improved in the years (since 2001) and this means that the data have been obtained with different accuracy. The error calculation was introduced in 2004 and gives an indicative quality on the single measurement but not all error sources have been taken into account. 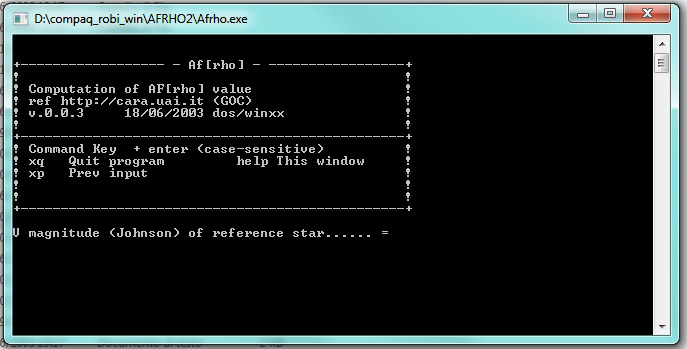 A better estimate on the error can be achieved by an internal check with data referred to many reference stars where available. Esternal checks with professional data show that the accuracy is usually better than 10% and comparable with the expected error. The accuracy can change according with the observational situation (comet brightness, S/N ratio, twilight or noise from light pollution, crowded starfields, background faint nebulae, and so on), on an average it is expected between 10% and 20% with a smaller error in the brigher objects. Of course faint object can be affected by an even larger error. B,V, R. I (Johnson-Cousins): R and I are higly suggested for a routine work and required to contribute to the CARA Project. For many comets can be assumed that the gas contamination is negligible in these passbands. S : refers to the Vilnius System and is approximated with narrowband filters centered qt 647 or 650 nm (10 nm FWHM). This is theoretically the best suggested filter as gas emissions are negligible. But it can be used with very bright objects only as the peak transmission (for Edmund filters) is around 50% and the narrow passband require much longer exposures to achieve a good enough S/N (indicatively about 100 times longer than unfiltered). B and V passbands have usually great gas contamination and could be used only in rare cases where no gas is present. In most case are useless. 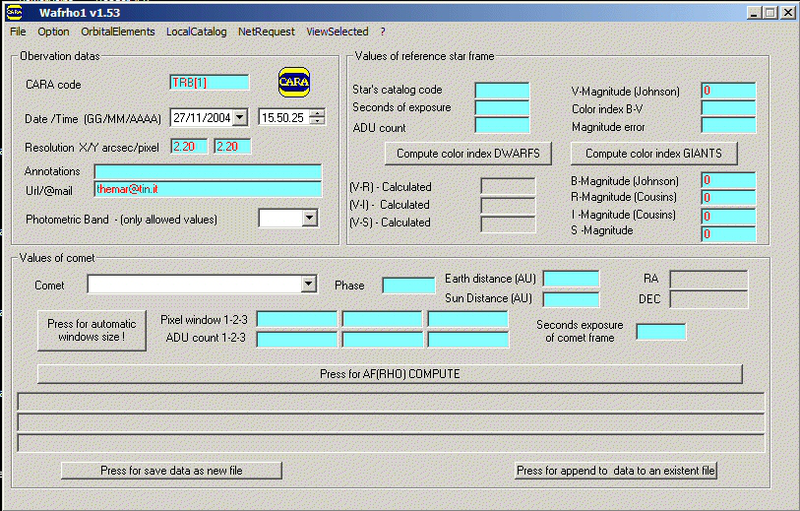 Vu, Ru refers to unfiltered data approximated to V or R bands according to the sensitivity of the ccd. This approach was used in early tests but it is not encouraged. Anyway unfiltered data are accepted for faint comets where the use of a filter gives a too low S/N for photometry. The digital era in amateur astronomers observing techniques allowed to explore new approaches in observing comets. Starting about since 1995 the potentiality of the new tecnhiques started to be explored and after the apparition of comet Hale-Bopp both the image processing and the photometry approaches have been deeply investigated. For the photometry the starting points were the guidelines provided by the International Comet Quarterly and the precious pioneering experience of V band CCD photometry run at the Crni Vrh Observatory by Herman Mikuz. 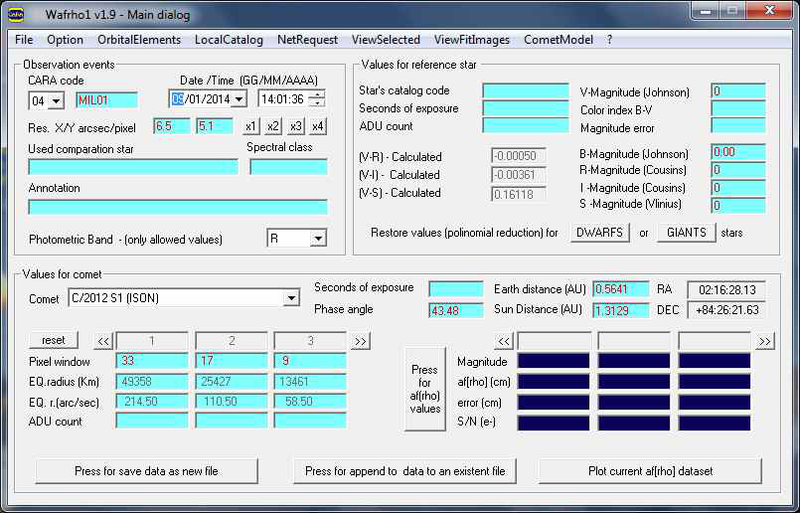 A first impprovement was to run a photometric program based on magnitudes referred to specific fixed measuring windows in km at the comet comet of 50,000, 25,000, 12.500 km (adding other larger or smaller sizes in specific situations if needed). The goal was to get more accurate and homogeneous photometric data always measuring the same portion of the coma characterized by the same phenomenology going beyond the limit of the not well defined total magnitude. The first results were encouraging but our goal was to get more scientific information from our digital images and that could be also useful also for the scientific community. In doing this we looked for a compromise between the result and a relatively simple method. Moving to the Afrho quantity approach was a quite natural step. The first steps toward a concrete realization of the database started in 2003 when the measurement procedure was greatly improved with the development of the Winafrho software, made by Roberto Trabatti. Winafrho allowed to better standardize all the observing procedure and to save the data in a standard archive format. In 2004 two released was made for Windows and Linux platforms, but only the Windows version was maintained and updated.Trabatti, it was clear that a multiaperture photometry with a larger number of windows could led to more accurate data. The first data format was based on fixed columns, but the format was slightly changed and improved in the years. The current database refers to the last format improvement made around 2008 (the format is described in the general information). Fig.3 – the 1.9 release of Winafrho with many improvements. It allows to import the FITS images for making measurements.